John has always been involved in Eventing: he rode up to 3* level, and is an International coach, having trained Jeanette for over 18 years. John found Bruce when a client took him for a lesson and mentioned he was for sale. 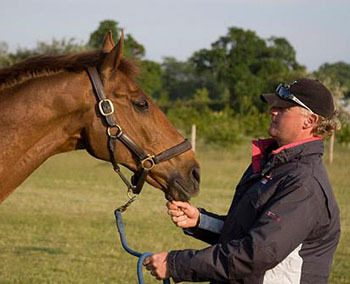 At first he looked at Bruce with a client in mind but liked him so much, bought the horse himself, at the start of 2012. John says: “Bruce is a long-term plan and I have enjoyed every step of the process so far. I enjoy working with Jan on any horse, but having my own with her is extra special. Seeing the horse develop is a rollercoaster ride, which is half the fun with horses. I’m not an owner who concentrates on results and prizes, I prefer to see them develop and progress – which is also Jan’s ethos. Most importantly I love to see my horse grow as an equine athlete.